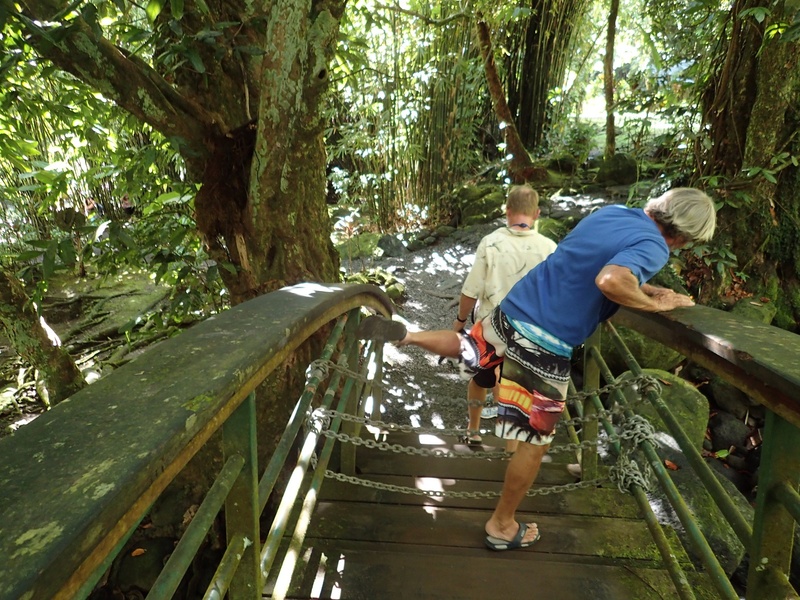 Steve, stepping over the chained bridge, blocking a Tahiti waterfall trail. For us, no island tour is compete without at least attempting one waterfall hike, if one exists. Click here for our favorite waterfall hike to date, in Fatu Hiva, Marquesas, and here for our most memorable waterfall hike in Daniel's Bay, Nuku Hiva, Marquesas. We regret not exploring the harder (more time consuming to reach) waterfalls of Tahiti's verdant interior. Shhh.... Truth be told, it's tough to beat the waterfall and trails of that other rain forest we hail from, the Pacific Northwest of Oregon and Washington states. Here, though, even cold waterfall pools are not snow-fed. We still haven't quite gotten used to that, but we are determined to keep trying the waterfalls of the South Pacific. Couldn't quite fit this whole tall Tahiti waterfall in the photo! This was written while in Cook's Bay Mo'orea, French Polynesia (S17.30.310 W149.49.207). . This was set to post while we're en route to Huahine. We plan make Bora Bora our last stop in French Polynesia as our standard 90 day visa expires, July 21st. After that we're off to American Samoa with a rest stop at Suwarrow, Cook Islands along the way, weather permitting. Please excuse these less than stellar photos. My Macintosh is dead; this is created using Wayne's PC laptop with minimal image editing software (no iPhoto images). The plan is to replace my Mac when we get to American Samoa. That will likely be early August. Still taking photos and on our adventures so watch for lots of catch up stories and images (and eventually, video -- lots of short clips)! All photos taken prior to Tahiti are resting comfortably on my former Mac hard drive and backup, just waiting to be accessed again.